Windham, Connecticut's Garden on the Bridge illustrates how historic structures can be creatively reused. The 1857 two arch stone bridge was built as a thoroughfare between two American Thread Company buildings and now houses a garden, enhancing nearby sites. Windham, Connecticut, (population 23, 678) was known as Willimantic Falls until 1821. The word Willimantic is the Algonquin Indian term for “land of the swift running water.” In 1822, Charles Lee built a factory on Main Street out of stone quarried from the Willimantic River. This factory helped spur growth in the town, as did the arrival of the railroad in 1849. From the end of the Civil War to the outbreak of World War II, Windham was known for its extensive production of cotton and silk. However, after the largest employer in the town, the American Thread Company, left Windham in 1985, the town suffered greatly. Today, Windham is in the midst of a renaissance due to downtown revitalization. The Garden on the Bridge project illustrates how historic structures can be creatively reused. The bridge itself, a historic two arch stone bridge, was built in 1857 as a thoroughfare between two American Thread Company buildings. The construction of a new bridge in 2001 made the structure obsolete. 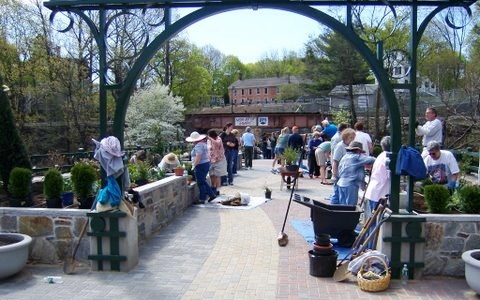 The town of Windham, with the assistance of the Garden Club, Master Gardener Program at the University of Connecticut, and the Windham Textile and History Museum, turned the bridge into a garden. The project has helped increase visitation at nearby museums, parks, and businesses. The Windham Textile and History Museum explores the history of the American textile industry, particularly as it was experienced in Windham throughout the 19th and 20th centuries. The museum is housed in two former buildings used by the American Thread Company. The Connecticut Eastern Railroad Museum in Windham exhibits historic railcars and includes a working roundhouse. The collection also includes a variety of railroad cars from the 1800s to today. Windham is an active member of the Quinebaug and Shetucket Rivers Valley National Heritage Corridor. The corridor reaches from eastern Connecticut to south-central Massachusetts. The town of Windham works with the corridor to promote tourism in the region.